An historic cave on the Paparoa National Park coastline. Teorumata Cave. • By Matthew. 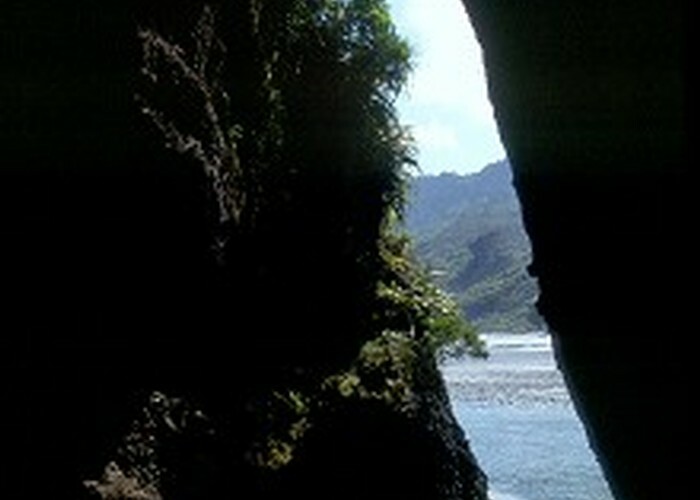 This cave was used by Māori and by European explorers travelling the coast. The cave has three entrances and a long side tunnel and is carved out of radioactive Hawk's Crag breccia rather than the ubiquitous limestone of the area. Te Ana o Matuku Cave • By Matthew. Licence: cc by-nc-nd. Park on the northern bank of the Fox River / Potikōhua (toilets and water here) at the car park where the Inland Pack Track begins. This location was also the site of the gold town of Brighton in 1866-67, hosting 5000 people and a staggering 53 hotels. To find the cave, cross the old road bridge to the highway. Cross the road (or follow the trail underneath the new bridge). A gap in the shrubbery leads to a pathway past a row of baches. The cave entrance becomes obvious on the right. An old road tunnel is also located on the south bank of the river, although the track into it has slipped, so access is difficult. Added 28 May 2002 by MatthewMatthew. 5 revisions, most recently 30 January 2019 by MatthewMatthew.